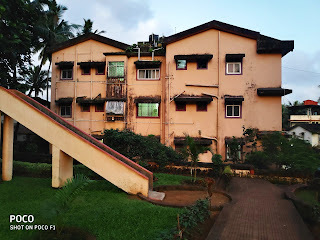 On Camera, It has a 12MP + 5MP rear camera setup The 12MP Sony IMX 363 sensor is secondary 5MP sensor captures depth information for amazing portraits. 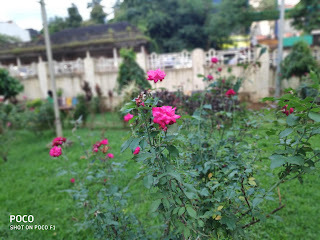 and 20MP front-facing camera. It has a USB type-C port, polycarbonate body, 3.5mm headphone jack up top, with dedicated amp powering the audio, Infrared face unlock. 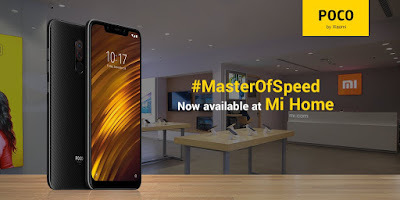 Poco F1 was launched as Online Exclusive on Flipkart and Mi.com which is now available across all Mi Home stores in India. The box content includes Handset, Adapter, USB Cable, Warranty Card, User Guide, SIM Tool, Back Case. 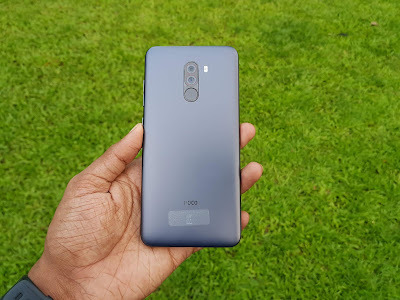 We have a base variant of Poco F1 which comes with a polycarbonate back. The side is also made up of plastic. 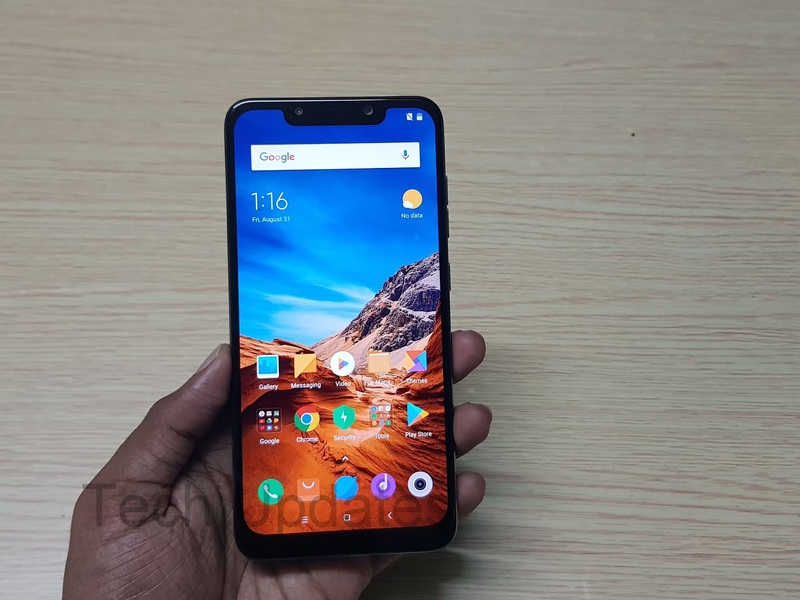 It comes with a 6.18-inch Full HD+ notch display, with 18:7:9 aspect ratio which is protected by gorilla glass 3, front facing camera, led flash, IR Face unlock sensor, earpiece which acts as stereo speaker below the display on chin there is Notification LED. There are also on Screen buttons. On the right side, there is volume keys and the power button. The left side It has a hybrid SIM tray that allows for dual SIM cards or a single SIM and microSD card. USB Type C port and speaker grill on bottom On top the a is a 3.5mm headphone jack. 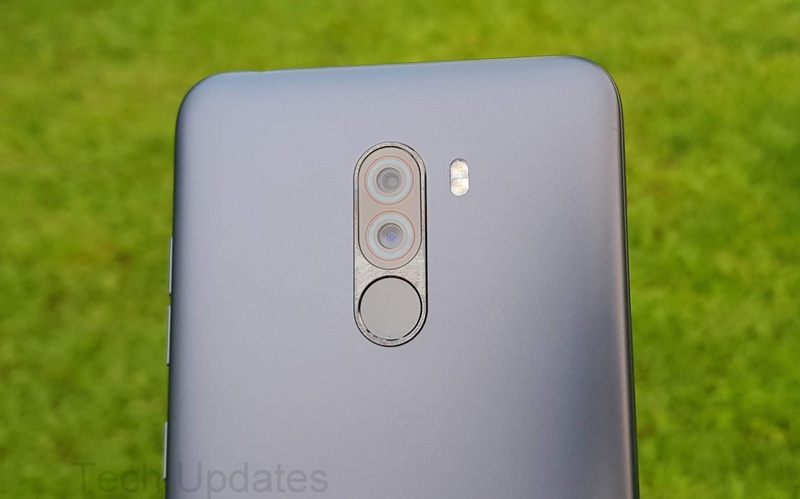 On the Rear, there is Dual Rear Camera Setup Dual LED Flash, fingerprint scanner and Poco logo below. Build Quality of phone is decent not that Great that plastic body looks Cheap. TPU Case provided in the box is useless which does not even fit properly. 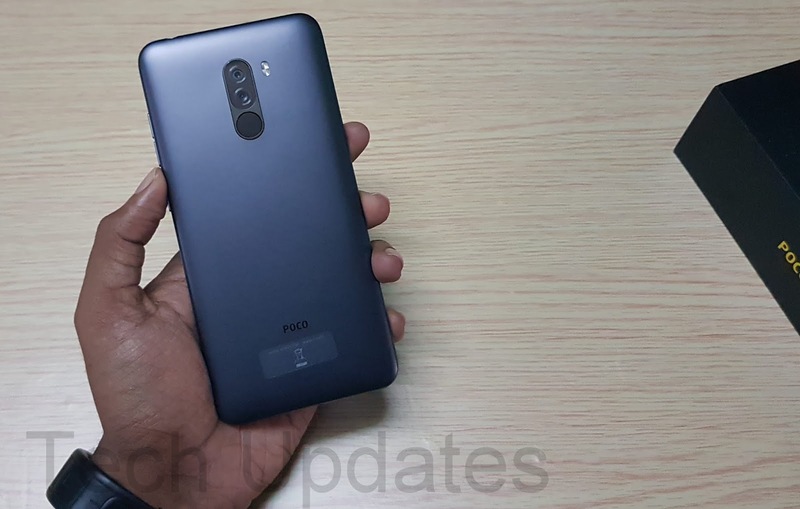 Poco F1 has a 6.18-inch (2246 × 1080 pixels) Full HD+ 18.7:9 Notch display which is protected by Gorilla Glass. You can also Hide the Notch, The Notch is bigger every time you get notifications you have to swipe down to check notifications, Also No battery percentage in Status Bar. 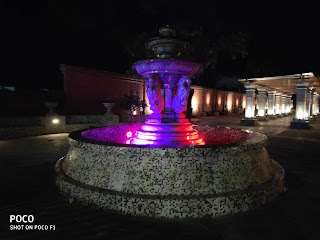 The display produces good colors and Viewing angles. In bright Sunlight, auto brightness Sensor works fine this Display Quality is decent not the best when compared to other flagship devices. We didn't notice any Screen bleeding issue with our unit. POCO F1 is powered by a Snapdragon 845 processor with 6/8GB of LPDDR4X RAM and 64GB/256GB UFS2.1 internal storage. It has support for Hybrid SIM Slot. Poco F1 comes with Liquid cooling. Performance is of Poco F1 is fast and smooth we played PUBG for more than 1 hour at high setting we notice some heating issue but when switched to normal settings there was no heating issue. In normal use like using social media Apps, Listening music there no heating issue or lag. Poco F1 comes with a 12MP rear camera with dual LED Flash, f/1.9 aperture, 1.4μm pixel size, Sony IMX363 sensor, Dual Pixel autofocus, a secondary 5MP camera with Samsung sensor and 20MP front-facing camera with ƒ/2.0 aperture. Rear Camera can record videos up to 4K there is also support for AI Mode. There is also Support for Slow motion. Camera performance in daylight is Good, the Low light camera is decent not that great front camera produces good selfies both daylight and Low light. Poco F1 runs on Android 8.1 Oreo with MIUI 9.6 based on Poco launcher which will be getting Android 9.0 Pie Update by end of 2018. It comes with IR face unlock which works under low light also. Fingerprint Scanner is also fast and responsive. Poco launcher brings App drawer, App suggestions display most of the used apps, groups apps automatically, group icon by color u can find apps by choosing the color. Communication, entertainment, shopping, tools, news, finance, games MIUI features Like Dual Apps, Second Space, App lock also present. 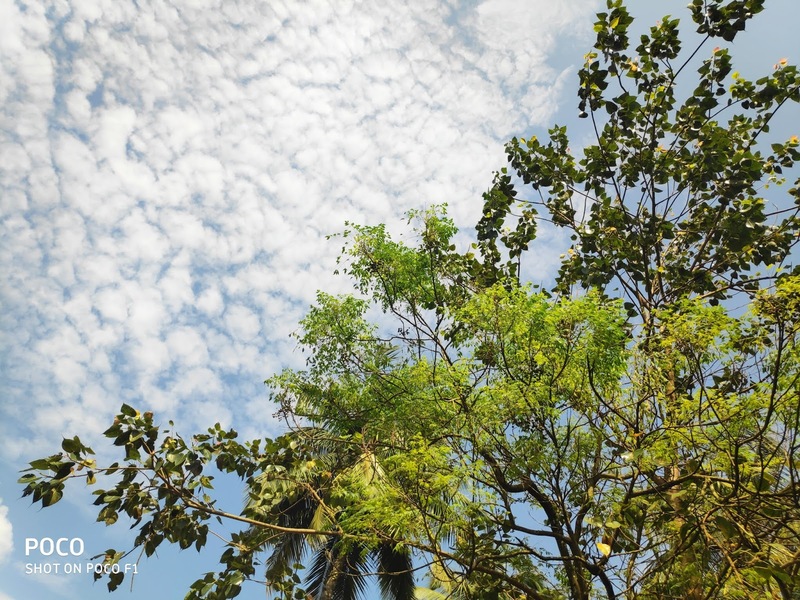 Preinstalled Apps include Microsoft Apps, Xiaomi Security, Cleaner, UC Browser, Community, Mi Store, Facebook, Amazon, Netflix, and PhonePe you can uninstall most of the Apps. We haven't noticed any Ads in Settings or other Apps in Poco smartphone. Connectivity options on Poco F1 include Dual 4G VoLTE, Wi-Fi 802.11 ac (2.4GHz + 5GHz), Bluetooth 5, GPS + GLONASS, USB Type-C. It has a Speaker on the bottom even earpiece acts as a Speaker, the Audio output from the speaker is loud and clear audio out from earpiece is not that loud. Audio Output is clear the device has support for Dual VoLTE, Idea, Jio, Airtel VoLTE worked fine without any issue. Poco F1 is packed by a 4000mAh battery with Qualcomm Quick Charge 3.0 which takes close to 2 Hours to charge fully which is able to deliver 1 and a half day of battery life with Dual SIM, Gaming, Phone Calls on Data. Poco F1 is Priced at Rs 20,999 for 6GB RAM, 64GB Storage, Rs 23,999 for 6GB + 128GB and Rs 28,999 for 8GB RAM 256GB Storage. Armoured Edition cost Rs 29,999 8GB RAM +256GB Storage. 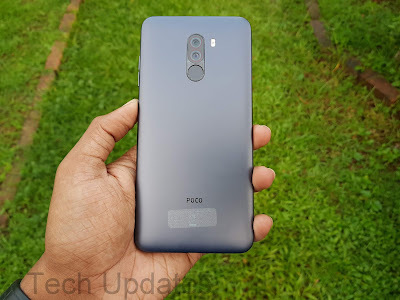 Poco F1 is budget flagship which offers Snapdragon 845, Good Camera, Battery Life, and IR Face Unlock. Poco F1 comes with the Plastic body, Bigger Notch, No DRM certification for HD streaming. Poco F1 takes on Honor Play which has Metal body, Kirin 970 Chipset. Both Zenfone 5Z and OnePlus 6 has much better build, Camera if your budget is around 25,000 than Poco F1 is worth buying anything above that OnePlus 6, Asus Zenfone 5Z, LG G7 ThinQ are other alternatives. 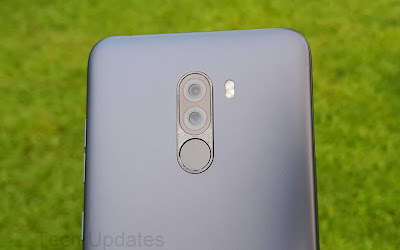 Poco F1 comes with Fingerprint Scanner on the Rear. It also comes with IR Face Unlock. Here's How to Setup Fingerprint Scanner, face Unlock on Poco F1 and Working. 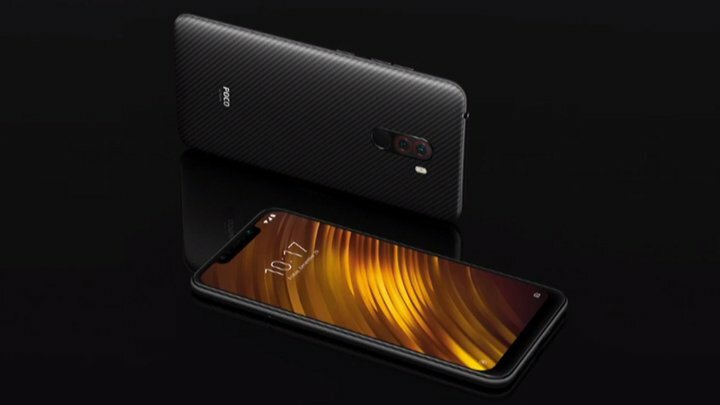 Xiaomi's Sub-brand has launched Poco F1 smartphone with Snapdragon 845. 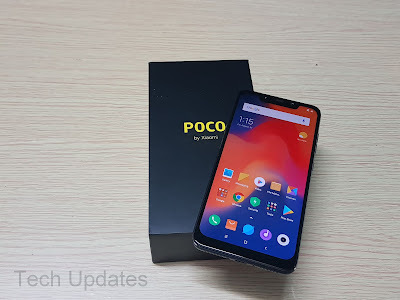 Poco F1 runs on Android 8.1 Oreo with MIUI 9.6 which comes with Poco Launcher and will be getting MIUI 10 based Android Pie update Soon. 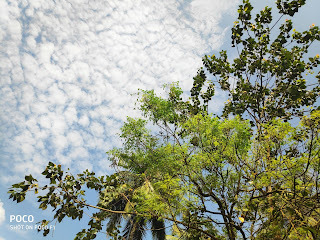 Here are some of Tips Tricks Hidden features of Pocophone F1 Smartphone also Pros and Cons. Poco F1 comes with 4000mAh Battery powered by Snapdragon 845 processor. Here's How much time it to charge device fully 0-100% and Battery Drain Test. Xiaomi Sub-brand Pocophone (Poco) launched Poco F1 smartphone in India which comes with Snapdragon 845 Processor and 4000mAh Battery. 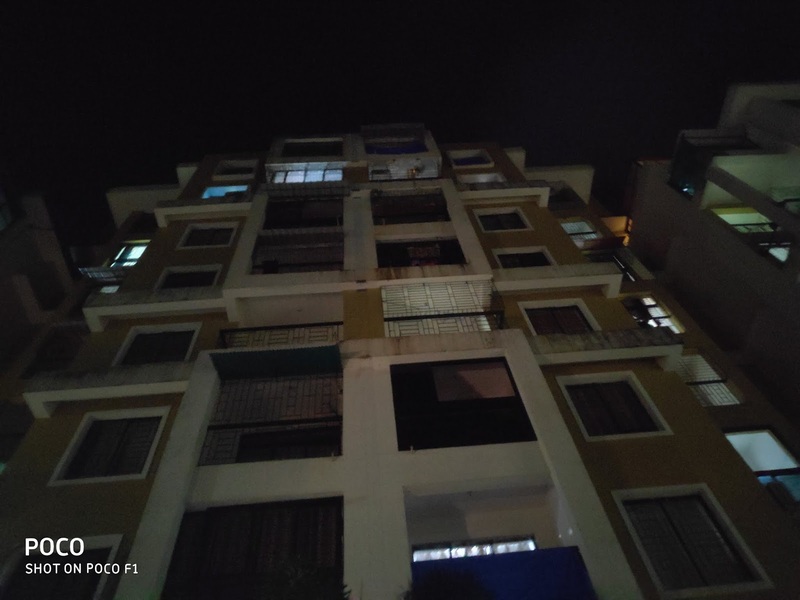 Here's Unboxing, Photo Gallery & First Look at Pocophone F1. Poco F1 is the First smartphone from Poco (Pocophone) Xiaomi's New Sub Brand. 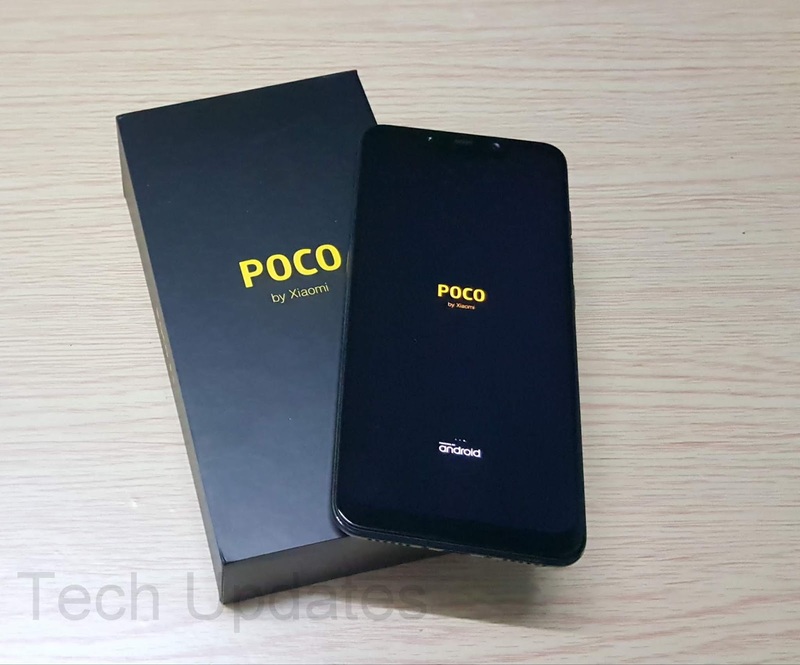 It comes with Snapdragon 845 Processor up to 8GB RAM and 4000mAh battery, Here are some of the Frequently asked questions about Poco F1.